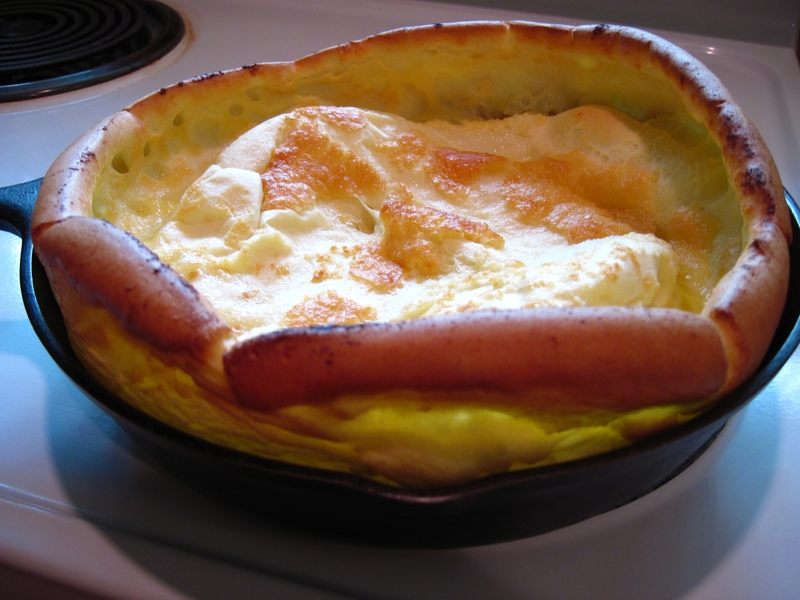 Here’s an easy breakfast for a weekend or holiday morning—a Dutch Baby Pancake! According to Sunset’s Ideas & Recipes for Breakfast and Brunch, this recipe is inspired by the miniature version of German pancakes that Victor Manca made in his restaurant. (Manca’s was a popular restaurant in Seattle in the first half of the 20th Century.) 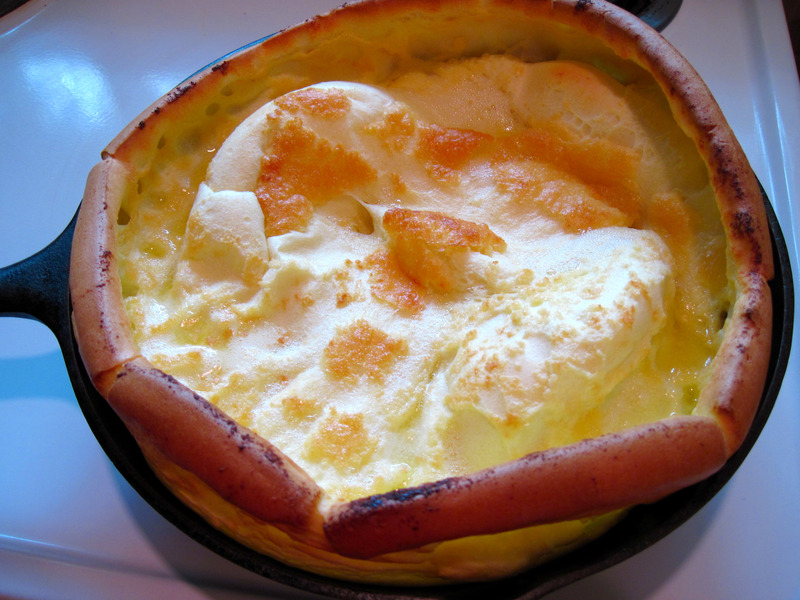 His children called them “Dutch babies”, and the name has stuck for oven pancakes of all sizes. The recipe can serve 3 – 6 people, depending on the size that you make. The 3-egg recipe will serve 3 (or 2 hungry people); the 6-egg one, made in a very large skillet or paella pan, will serve 6. Sunset suggests that you can use a large baking dish or even a foil roasting pan. If you’re unsure of your pan’s size, you can pour in quarts of water to see how much it holds. My 10-inch cast iron skillet is perfect for the 3-egg recipe. If I’m serving 4, I’ll use the 4-egg recipe in my 12-inch skillet. My Calphalon EveryDay Pan works well for the larger Dutch Babies. 2. Put the butter in the pan or baking dish and put it in the oven to melt. 5. Tilt the pan so the melted butter is evenly distributed; pour the batter in the pan and put it in the oven. 6. Bake until the pancake is puffy and well browned, about 20 – 25 minutes. The timing will depend on the size of your pan. 7. Serve immediately with your favorite topping. Classic topping: sprinkle with powdered sugar and then squeeze lemon juice from a lemon wedge over it. Fruit topping: serve with fresh fruit or cooked fruit. Sunset suggests sautéing apples, pears, banana slices or papaya in melted butter. Maple syrup and honey make great toppings, too. * If you don’t have a blender, just beat the eggs really well in a bowl, and then beat in the milk and flour. I haven’t done it that way, but I don’t see why it wouldn’t work. This looks great. My husband will really love this. He’s a breakfast guy. Your photos are great, made me hungry. So sorry it didn’t work for you, Vikki. This is the exact recipe that my grandmother used, but the topping was warmed salsa with sauteed mushrooms (in the salsa). Myself i like to add bacon bits and mushroom on top when you put it back in to melt the cheese. My friend likes to add spinach and potatoes. haha Also a great way to stretch 6 eggs to feed 4 to 6 people. This weekend I wanted to make a dutch baby, but realized we didn’t have any regular milk — only buttermilk. So I gave it a shot! It didn’t puff up and curl up around the edges, but the flavor was still really good. That’s good to know. Thanks, Laura! So we tend to like almond milk in our house. I just blended the crap out it. Batter was real smooth, and I added lemon zest. I used 5 eggs and 1 cup of almond milk and 1 cup of flour. How did it turn out. I have two dairy intolerant people in my home. Did it puff up. Cooked up perfectly. It was a beautiful presentation.